As many already know, on the 16th of September 2010 the vor v zakone Aslan Usoyan, also known as Ded Hasan, who after Vyacheslav Ivankov’s death is considered to be the leader of the Russian criminal world, was attempted to murder. Ded Hasan arrived to visit his son and he was wounded heavily at the porch entrance, his body-guard was also wounded. The bullet hit Hasan’s stomach. The surveillance cameras recorded the attempt against the Ded Hasan. Firing was made from the opposite house. It is seen on the video as mountain climbers get into the flat from where the firing was made. The cameras have also recorded the killer in addition to the attempt to murder. 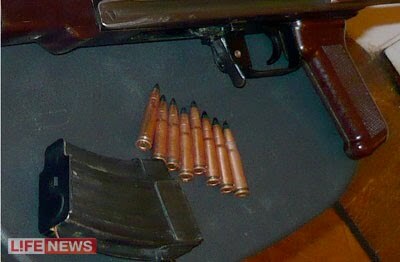 It is notable that the fire was made from Kalashnikov of the Chinese production. 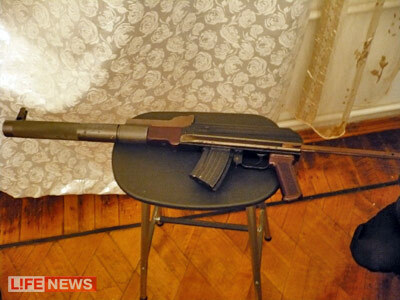 It is seen on the photos that the weapon is with silencer, however the sniper went even further. He fired with rare cartridges RS (reduced launching speed from the barrel). These cartridges were found in the sniper’s flat. These cartridges are out of production for a long time already and it is possible to get these cartridges only on the military supply spots. These cartridges differ from ordinary ones with subsonic flying speed and thus they don’t produce the blast during shot. And when firing is made from the weapon with silencer the volume of the shot sound is similar to the one from bow. The video shows visually the difference between ordinary cartridges and special ones. RS bullet flies about 3 times slower than the ordinary one. Comparison video of ordinary cartridges and special RS cartridges as well as 3D version of attempt to murder against Aslan Usoyan. And here is brief interview of the neighbor of Aslan Khasanov’s son. He is a foreign businessman who came for some days to Russia and lived in rented flat near to Usoyan’s son. This foreign businessman on video said that he did not see anything, see only a lot of blood in the entryway. For the moment Asan Usoyan is discharged from hospital. There are many versions for the reasons of the attempt, they say that he was shot because of Cherkizovskiy market. However, only the customers know about the real reasons.